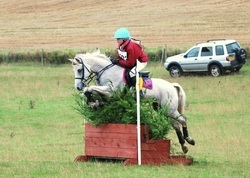 Despite gales at Hallington Top, our Autumn Hunter Trials was well attended and everybody appeared to be in good spirits. Mary’s Crew were successful in fighting the wind to erect one tent only but the SWN team of volunteers were very happy to be working in a variety of trailers – kept us out of the rain and wind!! Charles Moses as usual is a star in the commentary Box. He deserves a huge amount of praise and thanks from the SWN. Rob Jebb kept his cool as Chief Controller –he’s becoming quite a professional. Graham’s good humour lasted all day and there will be more entertaining e mails to come from him soon. The SWN would like to thank all the volunteers who helped to make this event possible, those that helped with the preparations, those that helped on the day, and those who will be helping tidy away!!! A special thank you to the jump judges who have no direct connection with SWN Pony Club who braved the muddy slopes to slide down to the valley to jump judge. Many needed a tow up the slopes to get home. Thank you also to our sponsors, the event would not be able to take place without them. Nunns Mitsubishi Grimsby. CJM Asset Management. CCW Paddock Care. Buckets Equine and Pet Foods Louth. John W. Joyce Engineering Ltd Great Limber. And of course Heather and Barnie Canter who so graciously allows us the hold out event at Hallington Top on their wonderful UK Chasers Course. Well done to everybody, there were no major incidents – it was a good day out. Results for 26th September 2010. 2nd Kayleigh Quirke, Liz Fieldsend. 5th Dale Preston. Hannah Gladding. 6th Sally Goulsborough. Fran Graves. Best SWN – Jemma Smith. Katrina Spouage. 2nd Joely Prior. Charlotte Esser. 3rd Sue Evans. Lizzie Evans. Excellent results from Caistor's once more successful busy schedules on Bank Holiday Monday - with the One Day Event running alongside Dressage, Showjumping and Hunter Trial Classes. Other results for the other events running on the day are below. With entries down due to many other competitions on the same day, some good quality combinations came forward, the first being Julie Ellis and her elegant 15 years old Thoroughbred, chesnut mare Minster Echo, taking the top slot in the Starter class after a years break from competing. Gill Andrews on her chunky cob, Blew, won the Newcomers class with a 5% lead over her nearest rival, gaining a whopping 74%, overall, the best score of the day. Gill had to rush off to a prior engagement immediately after her test, only becoming aware of her success later in the day. 14 years old, Mica Brown, brought along her two ponies, gaining a first and second rosette on 13 years old , April and receiving lower placed rosettes on Fleur, in their two Prelim classes. Having an easy time over the winter the ponies only came back into work two weeks previously. The Open Prelim class was won by Jennie Harrison riding her chunky chesnut gelding, Sid. Jennie and Sid have tried a ODE which Jennie said Sid enjoyed but Jennie had to overcome her nerves on the day. The last class, a Novice test, saw Bella Donna, a 17 years old, 14.2hh, part Exmoor mare, partnered by Vicky Williams secure the red rosette. “ Bella can be a little monster, pulling like a train but today was a good day,” commented Vicky. Photos have been kindly supplied by www.berylarmstrongphotography.co.uk - please check out the website to view all the pictures. Photos are of the winners in the classes. Competitors at yesterdays ODE were welcomed by cold and wet conditions, however a good turnout for all classes at CEC, which ran numerous one day event classes aswell as individual classes in each phase. Images are kindly supplied by www.smile-event-photography.co.uk please check out their website to see all of the photos. Following on from the success of the the first round - Trailblazers Dressage Round 2 saw good numbers of entrants - congratulations to those who will be moving onto the next stage. The Spring Hunter Trial at Caistor Equestrian Centre attracted a number of entries - congratulations to all those who attended. 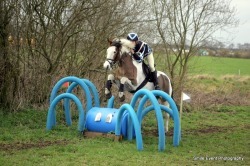 13.1hh Marshkin Harley won the Newcomers Prelim test with 11 years old Emily Watts on board. Grandmother Georgina who normally competes but is sidelined with a broken finger said, “ This is a first win for Emily in a Prelim class and to win against adults is really great.” Later, Emily was the only competitor to take up the challenge of the freestyle class. 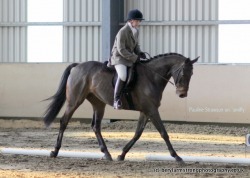 Patricia Ranby– Nuttal brought along two of her quality Show horses. George a strapping heavyweight hunter, having been Dublin Show’s Supreme champion and a contender at the Horse Of the Year show, took home a first and third rosettes in their two Prelim classes. 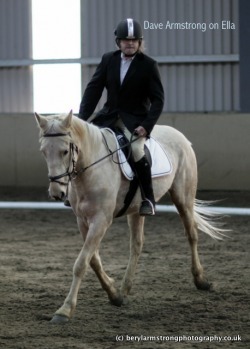 George was ridden by Abigail Gurbutt, having her first experience of competing George. 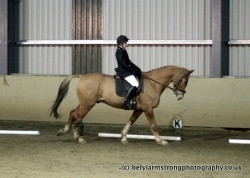 Edward another winning Show horse, ridden by Steven Urwin, was the only taker in the Long Arena , Pick a Test, class. Steve opted to ride a Medium test which had some intricate movements which Edward appeared to relish to give a good percentage score. 3, George Goodhand ( Little Miss Chatter Box)59.57. 3, George Goodhand ( Little Miss Chatter Box) 66.00. Best Turned Out- Lois Taylor. 3, Becky Blissitt ( The Wizard) 61.00. Best Turned Out- Karl Pacey. 3, Abigail Gurbutt ( George) 60.00. Best Turned Out- Robyn Lawrie. Pick a Test -1, Steven Urwin ( Edward) . Click here to view the full run down of results. The end of the year Championship show, for placed competitors from the last 10 monthly shows, mainly sponsored by Smile Photography and Buckets, Horse and pet feed specialist of Louth, got under way with an elegant Friesian bred 4 years old gelding, Pieter B, ridden by Carolyn Cartwright topping the Starter class. "Pieter is great for a 4 yrs old," said Carolyn. "We have even been competing in some mini ODE, which he has taken in his stride." 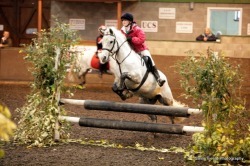 Eight years old, Tegan Spence, riding her 11hh, roan gelding, Rusty, took the top slot in the junior section. 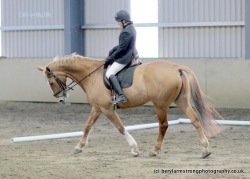 Tegan's, mother, Lisa said," this is only their second dressage competition. 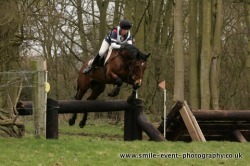 Tegan was not as nervous this time and rode with more determination, which paid off." Two young riders having a successful day, going home with handfuls of prizes, were 12 years old Elva Preston and her attractive coloured pony, All That Jazz and 13 years old Emily Smith with her petite grey, Sodamint. 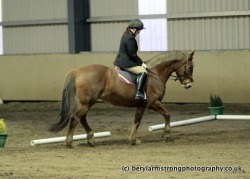 The pair came first and second respectively in the junior section of the Newcomers Class. Then reversing the placings in the next class Emily went on to beat off the seniors to take the trophy in the Open Prelim class with Elva coming a close third. 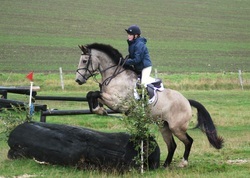 Both girls are member of the Pony Club and like to jump as well as the more sedate dressage. 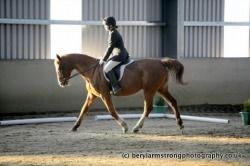 “This is the first win I have had at dressage," said Emily. The highest we have achieved before is fifth place." Another rider being in the placings in two Championship classes was Becky Davies riding her 13 years old, bay mare, Frankly My Dear, to take the Championship trophy and a second place in their Prelim classes. "I've owned Tara 18months," commented Becky." 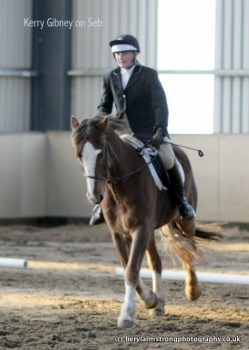 She has a brilliant temperament but gets a bit keen when jumping, so I think dressage suits her better. The last Championship class saw young rider, Maddie Horder, take the Novice trophy on her powerful moving, chestnut gelding Paparazzi, after already being placed in their Prelim class. 3, Pat Rafferty ( Angus ).